Do you recognise this wedding dress? Throughout the youth-quake of the 1950s Hull newspapers ran adverts selling tickets to emigrate to Australia; the cost of the ticket to this brand new life was £10.00. Australia believed it needed to increase its population to prevent the risk of being invaded a national worry at the end of World War 2. Great Britain was the first country to be targeted and benefit from incentives to start in the new world afresh. Well within the pocket of most those that settled in Australia became affectionately known as Ten Pound Poms and Hull took the golden opportunity with both hands. Jackie Kennedy became First Lady in 1961 but her interest in Chanel and Givenchy was already influencing women’s fashion worldwide. 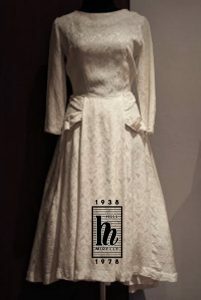 In an era when fascination with the Kennedy’s was at its height, her simplicity changed wedding fashions also. Especially popular with young married couples and the single and adventurous there was initially no restriction that exists in modern emigration to Oz. Until 1958’s Migration Act was passed, anyone who was British and could write in English was accepted as long as they had a ticket. One woman had a Ten Pound Pom ticket in her pocket when went into The House Of Mirelle a famous shop in Hull, and ordered her wedding dress. It was designed along the new modern lines and made of a heavy brocade. Parts were machined but others were hand stitched. Some of it was done quickly with a rough finish on the inside but the look was sleek and smart and quite like Jackie Kennedy. It had a net underskirt and a distinctive gathered section at the back of the skirt, a bit like a bustle. On the front of the skirt, there were two panels which sat on the hips and gave the skirt a very modern 1950s look. Article about the search in Hull Daily Mail 30/7/2016. Many people emigrated from Hull to Australia in the 1950s. The pages of the local newspaper the Hull Daily Mail had regular articles about those who had left, were returning or were departing. More than 3 million people emigrated from Europe to Australia between 1945 and 1960. Generations of Australians have British parents and grandparents as a result. Perth in Western Australia received those migrants through Fremantle the large international port. The woman who owned this dress got married and took it with her in her suitcase as she and her husband boarded the boat to ‘Freo. She was packing a dress she would always keep. Do you know who owned this wedding dress? Contact Carrie@houseofmirelle.uk. It was not only her special day it was reminiscent of a life she was leaving behind and a celebration with friends and family members she may never see again. But she was excited too and the thrill she and her husband felt was the same hundreds of others felt on the long boat journey across the world to start their lives anew. The dress was kept in a closet for over 60 years, tucked away with her memories until last year it saw light again – but this time it was hanging in a charity shop in western Perth. Rescued by Jo Moore and saved for future generations to appreciate, with the help of The West Australian newspaper, BBC Radio Humberside, The Hull Daily Mail and ABC 720 Radio we are trying to find the original owner to add their story to the history of House Of Mirelle. Do you know who got married in the dress? You can also ask your friends and family if they ever went to a wedding in Hull of a couple who then emigrated to Australia – show them this photo and see if it jogs their memory. 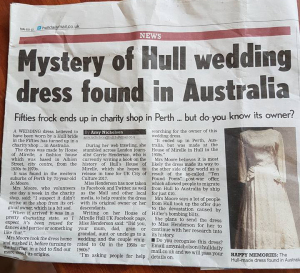 From Hull to Australia: who was the person who originally owned this dress? If you have any information to share, go ahead and contact carrie@houseofmirelle.uk or Jo Moore on chenin@iinet.net.au if in Perth.